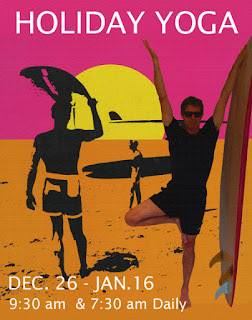 Johnny Batchelor's HOLIDAY YOGA will begin again this year on Boxing Day and run EVERYDAY including public holidays and weekends, until January 16 at the lovely and cool Moore Street Yoga Room, 62 Moore Street, Austinmer. There will be classes at 9:30am and 7:30am. The 9:30am - 11:00am class is for EVERYONE, whether you are beginning yoga for the first time, getting back to it, or keeping on, the class is fun and varied and will suit the relaxed holiday mood. It's a great class to bring your family and friends to. The class will adapt to suit the weather and, if it gets really hot outside, we can use a little air-conditioning. It is a good idea to arrive 5 or ten minutes early to take your place in the room. Sponsored by GongOnline. Awesome Inc. theme. Theme images by molotovcoketail. Powered by Blogger.